The prize, which is devoted to boosting writing in India, Pakistan, Sri Lanka, Bangladesh, Bhutan, Myanmar, Nepal, Maldives and Afghanistan, alternates its prize-giving venue. The winner of the DSC Prize 2015 was announced at the Jaipur Literature Festival, the winner of the DSC Prize 2016 was announced at the Galle Literary Festival in Sri Lanka and the winner of the DSC Prize 2017 will be announced at the Dhaka Literary Festival on 18 November. Surina Narula, who co-founded the prize in 2010 with Manhad Narula, said: "We are delighted to partner with the Dhaka Literary Festival. Being one of the leading literary festivals in the region with its focus on South Asia we see a lot of positive synergy in this partnership. The DSC Prize is now in its seventh year and in line with its South Asian essence, our plan has been to announce its winner in different South Asian countries by rotation. We announced the DSC Prize 2015 winner in Jaipur, India and the DSC Prize 2016 winner in Galle, Sri Lanka, and in continuation of this tradition we are now happy to announce the DSC Prize 2017 winner at the Dhaka Literary Festival in Bangladesh." 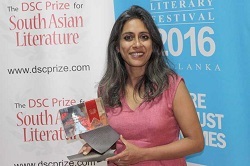 Sadaf Saaz, director and producer, Dhaka Literary Festival, said: "We are truly delighted to be hosting the DSC Prize for South Asian Literature, at this year’s Dhaka Lit Fest; one of the most prestigious international literary prizes, specifically focused on South Asian writing. The aim of the DSC Prize to bring writing on South Asia to a global audience, as well as nurturing the best talent writing about South Asia, aligns with our vision at Dhaka Lit Fest, of enabling voices from this region to have a reach far beyond our borders. The DSC Prize also seeks to promote writing in regional languages by encouraging entries in translation, an area we strongly support at Dhaka Lit Fest. We are very excited about this partnership, and look forward to having some wonderful conversations with some of the most talented writers in South Asian literature, at Dhaka Lit Fest this year." The 2017 prize is now underway and entries from publishers worldwide came in during February and March. These entries are being read and evaluated by the 5-member international jury panel which will announce a longlist of 12 to 15 books in New Delhi in August, and a shortlist of 5 to 6 books in London in September. Last year's winner was Anuradha Roy with Sleeping on Jupiter (Hachette, India).